Epcot is full of fantastic attractions, incredible entertainment, and endless food and beverages. With some of the very best table and quick service restaurants on Walt Disney World property, it’s a difficult task limiting down where and what to try to eat next. So, try it ALL (or at least as much as you can!) by snacking through Epcot. While most of our top 12 snack selections are available at quick service locations, we did mention a few table service restaurants, so you’ll have options if you decide to dine in. Without further ado… let’s eat! Let’s kick this list off with a classic snack! No trip around Epcot’s World Showcase is complete without a Funnel Cake from the Funnel Cake Kiosk located in the American Adventure pavilion. There are four fantastic Funnel Cake options on the menu here including: the Funnel Cake with sugar (the classic choice), Funnel Cake with chocolate sauce, Funnel Cake with vanilla ice cream, and last but not least… the memorable Cookies n’ Cream Funnel Cake with sugar, vanilla ice cream, crushed cookies and chocolate sauce. Go big or go home and enjoy the Cookies n’ Cream option! While we’re talking about the American Adventure pavilion, let’s chat about Fire & Drum Tavern. Well, this little kiosk holds the infamous Jumbo Turkey Leg you may notice someone snacking on from far away because of its sheer size. Don’t be shy to snack on your Turkey Leg like a caveman as you enjoy the juicy meat and great seasoning. Even better – order a Frozen Lemonade Slushy to go with it. Ok, so this one may seem like an odd choice, but if you are at all a fan of eggs, the Scotch Egg appetizer at Rose and Crown table service restaurant is a must-try at Epcot. Expect a perfectly cooked, golden-fried hard-boiled egg wrapped in sausage with mustard sauce. Plus, the eggs at cage-free. This British Pub is calling your name! Don’t let the name of this China pavilion quick service kiosk fool you, as they do offer much more than just refreshing tea! Two menu items available are the Curry Chicken Pocket and the Pork and Vegetable Egg Rolls. Take your snacking one step further with what they call the “Lucky Combo”. This combo gives you the two yummy menu items (the Curry Chicken Pocket and two Egg Rolls), plus a soft drink and an ice cream! This is the way to go both in taste and budget. If you’ve never been to Kringla Bakeri Og Kafe in Norway’s Pavilion, you MUST visit on your next trip! 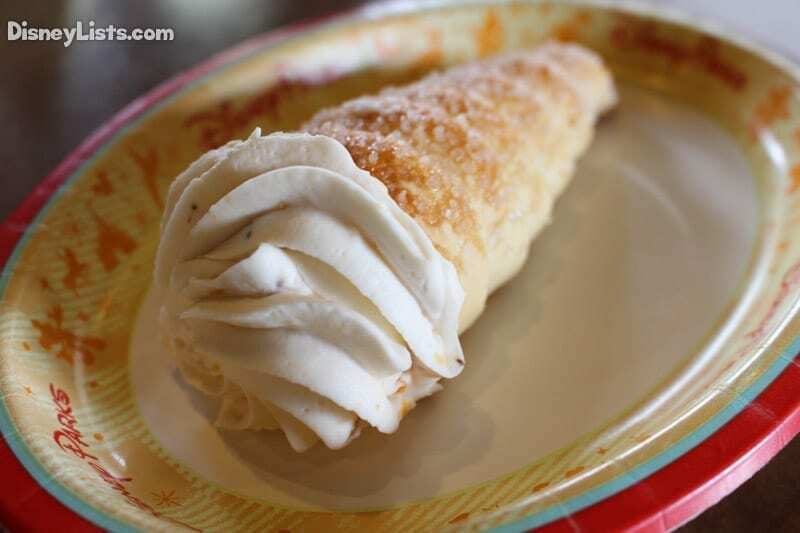 Multiple snacks and desserts await, including the amazingly tasty Troll Horn. The Troll Horns are crispy pastry shells that are sugar coated and filled with cloudberry jam and whipped cream. Delicious! We will say however, a strong runner-up to the beloved Troll Horn is the popular School Bread. 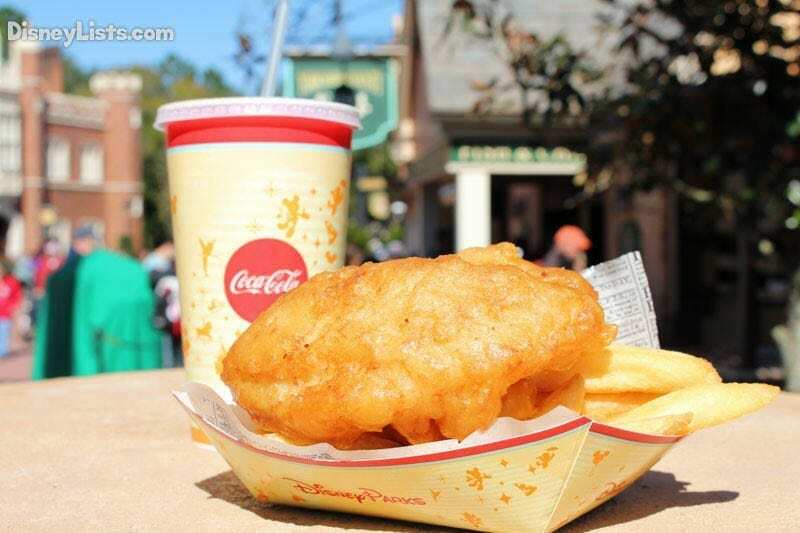 If you’re in the mood for true seafood, visit Coral Reef Restaurant in Epcot’s World Showcase where you won’t only get to dine with seafood cuisine but watch the aquatic life swim by in the massive aquarium. A perfect snack here that we’d highly recommend is the New England Clam Chowder. While we aren’t typically clam chowder fans, we will say we find this bowl extremely good with fresh baby clams, applewood-smoked bacon (yes, bacon! ), potatoes, and cream. Tasty! Another seafood favorite to hit our favorite snack list! This time it’s a wonderfully fried fish and what our British friends call “chips”. So, look for the Yorkshire County Fish Shop kiosk located near Rose and Crown and be sure to pick up some Fish and Chips for the road. You’ll receive two strips of fish served with chips (aka fries). It’s a perfect salty snack that is extra yummy when dipped in tarter sauce. We can’t help but take you back to China to a well-known table service restaurant called Nine Dragons. If you’re looking for something filling enough to serve as a snack but not too much for a meal, we’d recommend the Pot Stickers. We can’t get enough of these pan-fried chicken and vegetable dumplings. Dip them in the soy sauce it comes with and you’ll likely want a round of seconds! One word – Margaritas! YES, the new Choza de Margarita (which pretty much means Hut of Margaritas), is the place to be at Epcot. We absolutely love the margaritas here and the options seem limitless. But with these refreshing beverages, you’ll want a sustainable snack to go along with it. We’d recommend the Empanadas de Barbacoa. These empanadas are filled with barbecue beef and topped with chipotle sauce, crema Mexicana and queso fresco. They even come served with a side of corn tortilla chips. We love empanadas and we love barbecue, so the culmination of the two is perfect. The Refreshment Port holds a hidden gem of a snack option! Known by its’ followers as the “Cronut”, the Croissant Doughnut won’t be forgotten by your taste buds. It’s become a staple at Epcot! So, the original Cronut is a mix between a croissant and a doughnut sprinkled with cinnamon and sugar. But, don’t stop there! Get it served warm with some soft-serve ice cream for a snack of heavenly goodness. If you are able to snag a dining reservation at the popular Le Cellier Steakhouse, you’ll want to be prepared to try a variety of menu items. One option in particular that we’d have to recommend is the Canadian Cheddar Cheese Soup. If we could only snack on this Moosehead Beer and Nueske’s Applewood-smoked bacon soup for our meal, we’d be totally fine with that! While you’re walking around the park, you may just spot several people wearing Rose Gold Minnie Ears. This is the new trending Minnie Mouse ears that can be purchased at multiple locations. 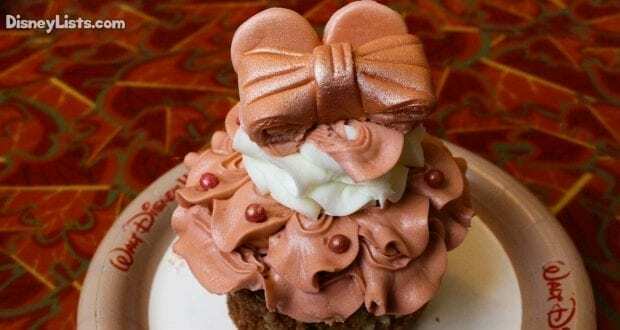 Well, Disney caught on to this trend and introduced Rose Gold Cupcakes that are what all the hype is about at Sunshine Seasons in Epcot. So, head over to The Land pavilion in Future World where you’ll find the quick service location, Sunshine Seasons. Check out their bakery display cases to spot the beautiful Rose Gold Cupcake which boasts a load of vanilla buttercream frosting atop a chocolate and vanilla marble cake. You’ll taste your way through a layer of rose, then white, and then rose again frosting which is topped with fondant Minnie ears and a bow. It may look too good to eat, but trust us – in one bite, you won’t be disappointed you’re devouring this one!